An airplane can take you to Burgas or Varna airports and we can offer you our services – air port pick up/drop off or rent – a – car.Taxi is not recommended as you may get cheated. We recommend always to bargain for the price of the trip and never take a taxi if you have not settled a price for the trip. Bulgarian Lev (plural leva). Leva cannot be bought in the UK. You can only change your Travellers' Cheques into leva in Bulgarian banks. Take a small amount of sterling or dollars to change in your hotel. It is illegal for tour operators and foreign exchange bureaus to accept travellers' cheques. Do not be tempted by the rates offered by the various money exchange bureaus - you might only receive half the rate on display. Never exchange money with local residents on the street.Good exchange rates you Can get only from local banks. Cyrillic. Signs along international motorways, in airports and resorts are also spelled in Roman letters. 86.6% of the population is Eastern Orthodox, 13% are Muslims. The Bulgarian Church is autonomous and headed by a Patriarch. Bulgaria is a parliamentary country. 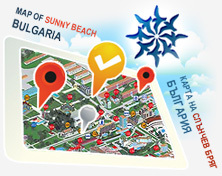 Book your holiday in Bulgaria this summer and you will soon be soaking up the sunshine of beaches of Sunny Beach. Take the chance to try some of the water sports that are on offer, enjoy a cruise along the coastline, or drive between different resorts, fishing villages and towns. For more sightseeing why not visit one of Bulgaria's beautiful monasteries, or head inland to the Balkan Mountains where there are traditional villages and fields filled with sunflowers. Bulgaria also bursts with colorful local customs, so try to catch a folk festival with music, singing and dancing in traditional customs. All these trips are offered by Property Management Group and you can subscribe for a day trip when you visit any of our offices in the area of Sunny beach . Once arriving, you will be able to meet our representative, who will kindly focus your attention on all best you can enjoy during your holiday. Bulgaria is located in Southeast Europe and occupies the eastern part of the Balkan Peninsula. To the north it borders with Romania, to the west with the Republic of Macedonia and the Federal Republic of Yugoslavia, to the east with the Black Sea, to the southwest with Greece and to the southeast with Turkey. Bulgaria occupies relatively small area - 111 000 sq. km, but is nevertheless distinguished by generous nature - sea with 380 km. long coastal strip and golden beaches, 16 mountains with their own characteristic features, shelters valleys and high plateaus, over 550 curative mineral springs, dozen of unique natural phenomena and 2000 thrilling caves, healthy climate and diverse flora and fauna. The country can be entered through any one of the many border checkpoints. Foreign driving licenses are valid on Bulgarian territory. Insurance is compulsory - it can either be taken out beforehand or on the Bulgarian border. The speed limit in the country is as follows: 60 km/h in populated areas, 80 km/h outside populated areas, and 120 km/h on motorways. Petrol stations are located on every 30 to 50 km. The climate is temperate continental with clearly marked four seasons: the average annual temperature is 10.5°C, the average January temperature is around O°C. A Mediterranean influence is felt in the country's southern regions. The average summer temperatures are about 30°C. Country relief is extremely varied: large plains and lowlands, low and high mountains, valleys and lovely gorges. As a whole Bulgaria's vegetation can be ranked among the Central European forest region, but the influence of the South Russian and Asia Minor regions is also felt. The higher part of Bulgarian mountains is covered by sub -Arctic vegetation, among which juniper forests predominate. In fact, Bulgaria boasts 3000 higher plant varieties - almost twice as many as in England. More than one quarter of the country's territory is covered with forests. The edelweiss is one of the rare plants growing in the country. It grows in places difficult of access, in the Pirin Mountains and the Balkan Range. Bulgaria is famous for its oleaginous rose which blooms in the Valley of Roses. The Bulgarian fauna is also interesting, with almost 13 000 animal species and subspecies, or about 14 percent of all European species. Fishing is possible in lakes, dams, mountain brooks and the sea, hunting - in special hunting grounds. The official language is Bulgarian. In regards with the international tourism, languages like English, German, French and Russian are spoken in the country's resorts, hotels and restaurants. Bulgaria is rich of ancient crossroads. It remembers many ancient civilizations and great people who wrote the pages of its turbulent history: bronze and iron spears and arrows, ruins of palaces and cities, wise words carved on rocks and stone columns, written on parchment and leather. One has to see the magnificent Thracian treasures, the monumental but beautiful work of the Greek and Roman cities in order to understand why Bulgaria became the cradle of Slav culture. For thirteen centuries the Bulgarian has been creating literature, art and music. Bulgarian culture has given the world men of great achievements, unparalleled in history. In the 9th century the brothers Cyril and Methodius, recognized as the patrons of Europe, upset the trilingual dogma and created the alphabet of the Slav people. During the 14th century John Koukouzel - The Angel-voiced carried out a reform in Eastern Orthodox Church music. Unknown painters created masterpieces which have become part of the UNESCO list of World Heritage.